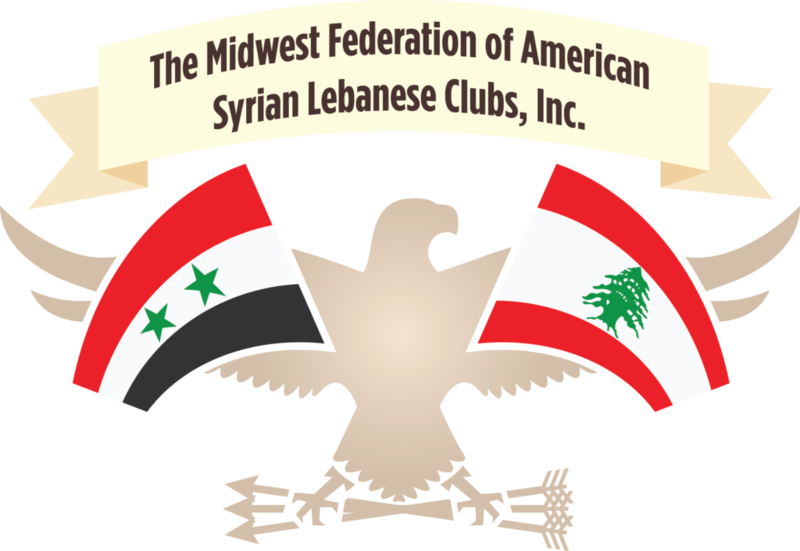 The American Lebanon Syrian Club of Kansas City was formed approximately in 1932 and is the only club that is a member of both the Southern Federation and the Midwest Federation. Many of our members have been active in the Federations. Cathy Coury Fedro, a former Federation vice president, served on the Midwest Federation Board of Directors for many years and is a recipient of their 1990 Woman of the Year Award. Lenette Campbell Crawford was on the Board of Directors for the Southern Federation and served as their treasurer. She was a recipient of the 2008 Woman of the Year Award. Many of our members and their children have received scholarships from both the Midwest Federation and the Southern Federation. Our club hosted the first joint convention between the Midwest and Southern Federations in 1998. Though our club is not a very active one, we do enjoy gathering for Kansas City Chiefs games, or a pot luck Middle Eastern dinner. On November 1, 1915, a group of twenty-two men formed the Syrian Christian Society. Its sole purpose was to bind and strengthen the extensive wave of Lebanese-Syrian immigration that was flowing into Michigan City by helping new immigrants with naturalization and assimilation into the fabric of American society. On October 31, 1916 that name was changed to the “Young Syrian Christian Society” and in 1919 another name change to “Young Men’s Syrian Christian Society”. They were able to purchase a piece of property on West 7th Street and built a club house there. In 1959, the club bought 50 acres on US Hwy 20 called “Wildwood”, where a clubroom was rented out for meetings, weddings etc. In 1973, the name was changed the current name of “American Lebanese Syrian Christian Society”. Due to declining club members, the property was sold in 1983 and members currently meet for monthly meetings at various locations. The club is proud to sponsor two scholarships: The American Lebanese Syrian Christian Society Club Scholarship and the George and Michael Borane Scholarship (both past presidents of the Midwest Federation). The American Syrian-Lebanese Ladies Club of Milwaukee has been an active member of the Midwest Federation since its beginning. Our club originally consisted of both men and women and dates back more than 100 years. Once our clubhouse was sold, the women and men organized separate clubs. Our club is a social and charitable organization that promotes our rich heritage. We come together monthly to do a little business and a lot of socializing. We enjoy spreading good cheer in our community though various charity projects and support St. Jude Children’s Research Hospital. Every year, we have an anniversary event, a Christmas Party, a family event, and many other events that our club sisters would enjoy. Serving the Greater Cleveland area since 1929, the Lebanese Syrian American Junior League (LSAJL) is a 501(c)(3) organization comprised of women of Lebanese or Syrian heritage, by birth or marriage, who work together to better our community through volunteerism. We are proud of our history and the impact we have had on the local community. The mission of the League calls for our officers and Board “To encourage its members to participate and establish funding for the furtherance of education and charitable activities.” To this end, we have long-established scholarship and welfare programs, and host several social activities throughout the year to foster camaraderie. In support of our welfare initiatives, members give of their time, talents and monetary donations to offer aid to those less fortunate. Fun runs, walks, volunteering at holiday events, fundraising and opportunities to donate items such as homemade blankets, toiletries or school supplies to local organizations are often combined with social gatherings, including wine tastings and retreats. The jewel of our community activism, however, is the LSAJL’s 60 year old scholarship program. League members donate, seek funding for, and oversee the distribution of scholarship dollars to area high school seniors and undergraduate college students. As of the year 2019, the League will have distributed a quarter million dollars in scholarships to assist students in reaching their academic goals. While at its inception scholarships were awarded to students in Lebanon and Syria, today’s awards are restricted to students in the Greater Cleveland area. . The League’s 90 years of contribution to the fabric of the Greater Cleveland ethnic community has also been recognized by the Western Reserve Historical Society of Cleveland, the city’s oldest existing cultural institution. The WRHS has taken custody of and archived photos, meeting minutes, financial reports, newspaper clippings, correspondence, event programs and scrapbooks that document the League’s proud history of helping women and families of Lebanese and Syrian background to assimilate in America while honoring their heritage and preserving their cultural traditions. In 1916, a group of mostly Christian immigrants from the Lebanon area of Syria formed a club and met routinely in the basement of a member’s residence on the south side of Chicago in a neighborhood called “Little Zahle.” In 1918, the Syrian Progressive League was officially established and incorporated by the members. Ladies’ groups to the League, the Syrian Ladies Aid Society and the Syrian Girls Sorority, were formed in the early 1920s as auxiliaries to the League and met at the same residence. With the independence of Lebanon, the club name was changed to the Syrian Lebanon Progressive League in 1947. In 1953, the Associated American Syrian Lebanon Clubs of Chicago, Inc. was formed by the League as a separate entity to purchase a clubhouse at the corner of Laramie Avenue and Washington Boulevard in Chicago. Due to the migration of members into the Chicago suburbs, that clubhouse was sold in 1969. Regular club meetings since then have been held at various venues. In 1970, the club name was changed to the Phoenician Club of Chicago, and its Constitution limited membership to those of Syrian, Lebanon, Palestinian or Jordanian heritage, or the spouse of such heritage. The Phoenician Club bylaws limited its association to the Midwest Federation of American Syrian Lebanon Clubs and as a chapter member of ALSAC (American Lebanon Syrian Associated Charities). The late founder of St. Jude Children’s Research Hospital Danny Thomas was a nightly entertainer in a Chicago nightclub in the late 1930s to about 1941. Club members frequented the venue, and Danny would visit the Club and its members. He approached the Club at a special meeting in the 1950s with his requests for help to raise funds to build a new children’s hospital. The hospital was formed in 1962 as St. Jude Children’s Research Hospital. ALSAC originated in Chicago with primarily members of the Club. The Club’s attorney/member drafted the first bylaws of ALSAC. ALSAC has been a primary charity of the club since then. The Phoenician Club has an enduring history. Since the Midwest Federation’s founding, many of its officers and directors has been members of the Club. The Club and its members have raised and donated thousands of dollars through regular charity contributions to churches, Middle East welfare programs, the Chicagoland needy, the Midwest Federation Scholarship program and to St. Jude’s Children’s Research Hospital. One of the primary goals of the Club is to raise funds and provide college scholarships annually to children of its members. The Club is very active with social gatherings and several special events throughout the year, and with a main focus to preserve and promote our heritage and cultural traditions. Visit the Club’s website to contact us and see more of the Club on Facebook. In the spring of 1936, a dozen young Syrian men and women banded together to raise funds for their local church. After successfully raising funds for the church, the group decided to continue their efforts to assist the Syrian people of Omaha. The Phoenician Club of Omaha was born as a nonpartisan, nonsectarian club. Shortly after forming, the club joined the Midwest Federation of American Syrian Lebanese Clubs and hosted the 4th annual convention at the Fontenelle Hotel. The club provides many charitable contributions to organizations both locally and nationally. Charities include Madonna School for Handicapped Children, St. Jude’s Children’s Research Hospital, the Midwest Federation of American Syrian Lebanese Clubs’ Scholarship Fund. The club’s main focus is to preserve its rich heritage. Since its origin in 1936, the club has passed tradition and friendship to generation after generation. The Young Phoenician Club of Des Moines was established in 1965 with the help of its parent club, the Lebanon Club of Des Moines. There were 20 Young Phoenician Club (YPC) charter members. The Young Phoenician Club was host to a Mahrajan convention in 1966 and Midwest Federation conventions in 1977 and 1992. Two of the YPC charter members have served as President of the Midwest Federation: Dr. Michael Coury (1975-1978) and Edward Salem (1979-1981). Dr. Coury’s sons are currently Federation officers. Joseph is First Vice President, and John is Treasurer. Over the years, many YPC members received prestigious Midwest Federation awards. Awards for Woman of the Year were presented to Rita Coury and Cathy (Coury) Fedro. The Young Phoenician Club has been awarded Club of the Year. In 1986, at the Midwest Federation’s 50th Anniversary convention in Indianapolis, Dr. Michael Coury was honored as the “impact” man of the first 50 years. In addition, Federation scholarships have been awarded to many student YPC members. The Young Phoenician Club meets at least three times a year, with social events such as the annual summer picnic and eerie Halloween costume party. The YPC has made annual donations to the Midwest Federation Scholarship Fund for over forty years. The club also makes contributions to St. Jude Children’s Research Hospital and to local charities.